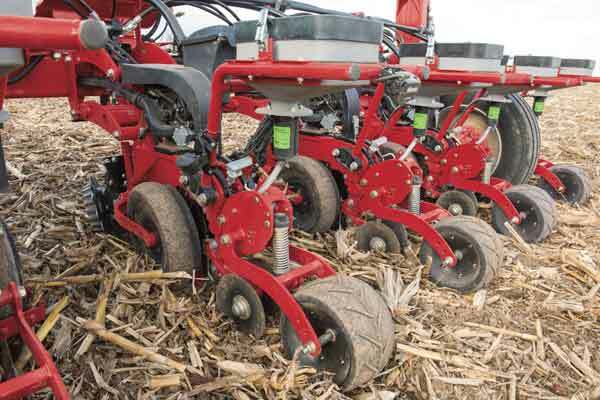 Competitive test-plot research showed that the new Early Riser planter delivered more accurate seed placement and faster emergence at high speeds than comparable competitive models. “The results are clear,” said McClelland. “We out yielded our competition. Whether planting laser-straight rows at 10 miles per hour, or a contoured field, the new Early Riser planter was consistently accurate. Furthermore, the new rugged design demonstrated outstanding durability and reliability." All-new, best-in-class rugged row unit — delivering speed, precision and performance. Built with heavy-duty cast components, the 2000 series stands up to high speeds and tough, fast-changing conditions. An industry-leading 26-inch toolbar clearance, plus a 60% increase in vertical row-unit travel, helps accommodate uneven terrain without sacrificing accurate seed depth and consistent closing. Where seed meets soil, larger and heavier Earth Metal blades provide long-lasting durability. An agronomic offset design allows the leading opener to slice through tough crop residue and ensures proper seed-to-soil contact, while self-adjusting mud scrapers ensure consistent performance in heavy, wet soils. 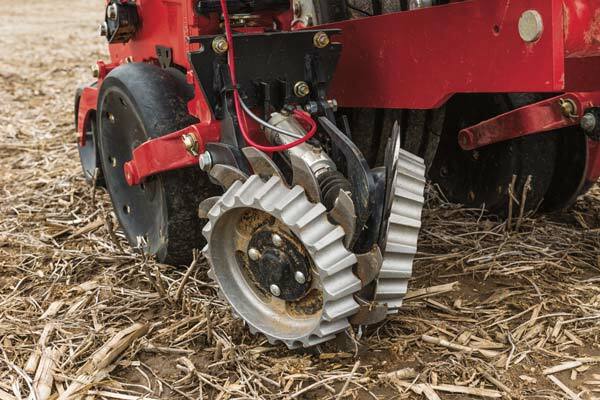 Exclusive trailed gauge wheels with soil-relief grooves help row units ride better in rough seed bed conditions while minimizing sidewall compaction. All this leads to a more consistent seed bed, uniform germination and earlier emergence. Aligning the gauge wheels alongside offset openers provides better results, no matter the soil type. New, larger inverted closing disks provide gentle and consistent soil coverage back over the seed. Then the press wheel ensures the proper seed-to-soil contact necessary for uniform germination and emergence. An in-cab adjustment option can fine-tune closing disk down-pressure to suit different field conditions. Integrated game-changing technology delivers precise seed placement As the only planter designed and built with integrated Precision Planting components, producers can realize next-generation planting technology — direct from the factory. “While others in the marketplace may offer some of these components, only the 2000 series Early Riser planter was designed to integrate Precision Planting technology with the industry’s most agronomically designed row unit,” said McClelland. Developed specifically for the 2000 series Early Riser planter, the all-new seed meter and electric drive deliver accurate and consistent seed singulation, populations and in-row spacing for a variety of crop types. The vSet 2 meter and vDrive electric drive systems offer precise seed metering and curve compensated spacing with the simplicity of tool-free crop changes and adjustments. Additionally, the new minihopper and its single air-intake screen is easy to access and clean. 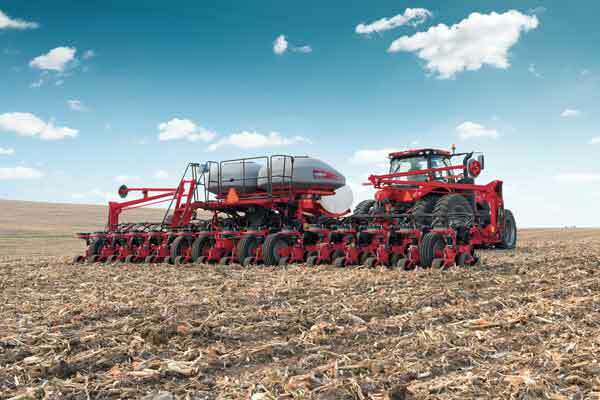 “The electric meter and DeltaForce allow each row unit to function like a single row planter,” added McClelland. “Every row unit reacts automatically to its own particular conditions, from curve compensated spacing, to an automatic up/down force system for precise depth control.” In addition, row-by-row shut-offs for seed, liquid fertilizer and chemical can greatly reduce input costs and create even greater efficiencies. For the most accurate seed delivery and placement, the 2000 series Advanced Seed Delivery™ option includes the new SpeedTube. Available for corn and soybeans, it uses a flighted belt delivery to control the seed from the meter to the furrow, eliminating the drop and tumble variability of traditional gravity drop tubes — especially at high speeds. The SpeedTube belt moves at a rate that increases and decreases with planter speed, ensuring optimal seed spacing. Furthermore, a SpeedTube planter can be easily transformed to conventional seed tubes for additional crop-type versatility, with no tools required. The new Early Riser planter in-cab controls offer complete customization. Producers can choose between the total planter control of Advanced Seed Information™, available with a single screen through the Case IH Advanced Farming Systems (AFS) Pro 700 display, or the FieldView with the 20/20 SeedSense options available from Precision Planting. Designed for simplicity and serviceability, the new Early Riser planter features fewer parts than previous models, which means easier operation and less maintenance. “We engineered this planter so producers can spend more of their day planting,” said McClelland. “A streamlined design makes service access easy and simplifies adjustments." The new Early Riser planter makes switching between crops quick and easy. A simple, accessible T-handle depth adjustment makes changing seeding depth in 1/8-inch increments quick and easy. An indexing system provides consistency across all row units, and an alphanumeric scale makes it easy to confirm all row units are set at the same depth. The new Early Riser 2150 planter has already been selected to receive the prestigious 2016 AE50 award from the American Society of Agricultural and Biological Engineers (ASABE). ASABE annually recognizes the most innovative products that will best advance engineering for the agricultural industry with the AE50 awards. First public reveal at National Farm Machinery Show 2016 The first of the new 2000 series Early Riser planter models, the Early Riser 2150 model, will debut at the National Farm Machinery Show in Louisville in February. Producers attending Commodity Classic in New Orleans in March will also be able to see the new planter and discuss features with Case IH representatives. First models, which include 12-, 16- and 24-row 30-inch front fold machines, will be available for the 2017 planting season. McClelland indicates that while the new Early Riser 2150 will represent the latest planter technology available, not all producers will want to invest in these advancements. Case IH will still be producing the benchmark of all planters, the cost-efficient Early Riser with ASM (Advanced Seed Meter) technology. “In addition, there will be the option to order the current Early Riser planter factory-ready for integration with Precision Planting components,” said McClelland. The three options of planting technology ensure that Case IH is addressing the needs of every producer’s individual planting needs.